Give the gift of hope this holiday. Hunger is tough any time of year – but it's tougher during the holidays. But today your gift can go twice as far thanks to a generous gift from Tony Robbins. 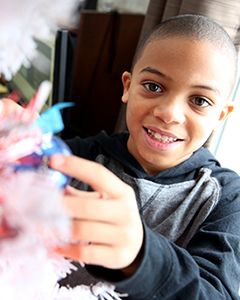 Your gift can help provide hope—and twice as many meals—to families facing hunger this holiday season through the Feeding America network of food banks. Donate today to help provide double the meals this holiday season. Donations made through this form support Feeding America's entire mission and will not be designated to a specific program or location. Tony Robbins has committed $5,000,000 to support Feeding America and will be used to double the impact of gifts made in response to this online campaign. Gifts received after the campaign or in excess of this amount will not be matched but will still help provide food and groceries.